You can approach guitarist Tim Sparks’ music from several directions. You can enter through Tchaikovsky’s Nutcracker Suite, originally arranged for orchestra, rearranged by Sparks for six strings—a feat that won him the 1993 National Fingerstyle Guitar Championship. You can look for other CDs he has made for the German label Acoustic Music. You can track down recordings by the Twin Cities jazz group Rio Nido, popular during the 1970s and 80s and still sorely missed. You can enter through the bluegrass and jazz Sparks heard as a child and finally got around to recording on his new release, Sidewalk Blues (Tonewood, 2009). Or you can walk through the door marked “Radical Jewish Culture,” a series on John Zorn’s Tzadik label. Starting in 1999 with the solo album Neshamah, Sparks has made five recordings for Tzadik. His latest, Little Princess (2009), is a collection of tunes by Naftule Brandwein, aka “Nifty,” the King of the Klezmer Clarinet. It’s an elegant, polyglot, sophisticated recording—World Music for the 21st century. Born in Winston-Salem, North Carolina, Tim Sparks “appropriated my dad’s guitar” as a child and started picking out tunes. When encephalitis kept him housebound for a year, he taught himself to play traditional country blues and gospel by listening to old LPs, the radio, and his grandmother, who played piano in a small church. Impressed by Tim's skill, an uncle nominated him for a scholarship at the North Carolina School of the Arts, where Sparks studied the classics with Segovia protégé Jesus Silva and began adapting compositions by Jelly Roll Martin and Fats Waller for solo guitar. Rather than continue on to college, “I got my degree in the world of music, the world of nightclubs.” He went on the road with a funk and R&B band and ended up in Minnesota, where he worked as a session player and became part of the vocal jazz group Rio Nido. That kept him busy for several years, after which he worked in a variety of groups, traveled, and moved to a farm in northern Minnesota with his wife, Chyrll, who is part owner of the country music festival We Fest. I’ve been an admirer since first hearing a track from his Nutcracker Suite on the radio several years ago, then ordering the CD and almost wearing it out. When I heard he was playing a late-night show for Little Princess at a local jazz club, I grabbed a table near the stage so I could see his fingers on the strings. We spoke on the phone not long after. Pamela Espeland: How did a nice Christian boy from North Carolina end up making radical Jewish music for John Zorn? Tim Sparks: It all started with Rio Nido. That was a pretty successful Twin Cities jazz group for quite a long time. It was a period of our lives collectively when we all had families and worked constantly. We were the house band at a club; we played there two weeks a month. You can’t get those long gigs anymore. The band folded around 1986–87. After that, I played like a lounge lizard—straight-ahead jazz, R&B—for many years. I went on a long trip to Europe with my wife. Part of it involved traveling to Hungary, Yugoslavia, Bosnia. I encountered a lot of music that was really exotic to my ears. I’d always been curious about Eastern European music. When I was a teenager, my two favorite recordings were Village Music of Bulgaria and a Charlie Parker album on Verve. In a funny sort of way, those two streams finally came together in the Tzadik recordings. When we came back from Europe, I began digging all kinds of people. Plus I started learning a lot of things Rio Nido didn’t play—Brazilian music, world music, Edith Piaf. I took up some Middle Eastern instruments—oud, fretless lute, saz, long-string lute. I played with a belly dancer, with a group called Rubaiyat that played Persian music, with Boiled in Lead, with a Brazilian group called Mandala. I studied Jewish music with accordionists Maury Bernstein and Mark Stillman. I played with a group called Voices of Sepharad, music of the Sephardic tradition. I had a very hands-on experience with Jewish music. I get asked, “Why are you playing this music? You’re not Jewish.” The answer is, first of all, it’s beautiful music. Jewish music shares a quality with gypsy music of touching on a diverse array of cultural and musical boundaries, especially Middle Eastern and Eastern European, with a particular soulfulness that moves me…. There’s a mystery in it; you never get tired of it. Like the blues progression. That “Hava Nagila” scale pushes a button for me. PLE: How did you and John Zorn first get together? TS: Through my friend Duck Baker. Duck was kind of a mentor to me as a teenager. He lived briefly in Winston-Salem and I used to go over to his house and he’d play Sun Ra and Frank Zappa. Perverse on his part; illuminating for me. In the 60s, guitar music was in a bunch of separate categories and players never crossed the line. Classical guitarists completely ignored jazz and so on. Then gradually, because of people like Lenny Breau, Chet Atkins in a way, and Duck Baker, we reached the point where we’re at today, with incredibly eclectic fingerstyle guitar. It’s been quite a fluorescence in the last 20 years. PLE: Can you explain what you mean by “fluorescence”? TS: In a cultural fluorescence, you have a certain idea that catches on and blossoms. It’s a tipping point, when many people and ideas connect. 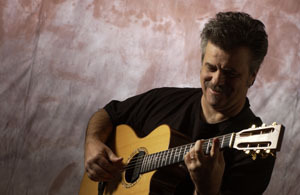 The fluorescence in fingerstyle guitar started to happen in the late 1980s and early 90s. I visited Duck at some point in the 90s, and he had done this great record called Spinning Song: Duck Baker Plays the Music of Herbie Nichols for Zorn. [Zorn was the executive producer.] It may be Duck’s best record. He’s known for playing Irish/Celtic music. PLE: Which is notably absent from your repertoire. TS: Seems to me there’s enough people covering it. There’s nothing I can add. I try to do things that add to the overall value of the body of guitar work. I’ve always been drawn more to the tri-tonal, Afro-American, Middle Eastern music sounds. Though I did go to Ireland on tour and decided that when I die, I want them to pour my ashes down the toilet of O’Flaherty’s bar in Flago. TS: So Duck said, “Zorn is really righteous.” I sent Zorn one of my Peter Finger [Acoustic Music] CDs, a fusion of Middle Eastern and American roots music called Guitar Bazaar. I had done an arrangement of Bartok’s “Romanian Dances” as part of that record. Zorn said he really liked it and wanted me to do a record of Jewish folk music, but done in my style. I sent him some stuff I was doing with David Harris and Mick LaBriola [of Voices of Sepharad] but he kept insisting on the solo guitar thing. That’s what he really wanted. So I worked on it. Any artist is happy to work. Another cool thing about Zorn was he said, “Be as eclectic as you want. Pick out the songs you like.” I chose things I thought were compelling or beautiful. He also encouraged me to be eclectic in the way I play the tunes. So I freely mixed country with jazz and bebop riffs and blues runs and Middle Eastern scales. That for me made Nehama [Sparks’ first CD for Tzadik] a really fulfilling project. It was a stew of guitar music that had all these diverse elements. More like a salad than a stew, because everything still has its own unique identity. Every time I make a record, I have a few tunes left over, seeds for another record. Zorn put me together with Greg Cohen and Cyro Baptista for Tanz, a trio record. Then the next time [for At the Rebbe’s Table] he said, “I want you to add Marc Ribot and Eric Friedlander.” Then we did Masada Guitars, where he had me and Bill Frisell and Marc Ribot each pick out tunes from his Masada songbook. Zorn never wants to repeat himself. PLE: What about Little Princess? TS: I worked up a lot of tunes—more Masada tunes and a bunch of other stuff. Zorn liked the Brandwein stuff best. I may by now have recorded almost everything there is by Brandwein. He only recorded 25–28 tunes that have been released by Rounder. When I was working on Neshama, I came across that recording and used it as a resource. I like Brandwein’s tunes a lot. A hundred years ago, he was playing with a palette and a repertoire that reflected multiple influences. His music’s got a lot of different bags in it. PLE: You must be having déjà vu. Releasing Little Princess and Sidewalk Blues in the same year is similar to what you did ten years ago—with Neshamah and One String Leads to Another, your album of mostly original compositions for Acoustic Music. TS: That’s kind of a coincidence. I put together Sidewalk Blues, put it out, and didn’t realize that I was going to wind up recording Little Princess so soon or that Zorn would release it so quickly. We just recorded Princess in February. That’s another nice thing about working for Tzadik. It’s a small label, always righteous…that’s what Tzadik means. A Tzadik is a righteous person. I’ve been very happy to do stuff with them. Very cool catalog, cool community. PLE: Are you still composing? TS: On Little Princess, the core songs are ten percent of the song, then twenty percent my arranging, then a lot of composition that developed those arrangements before improvisation. I’m not right now composing songs from scratch. I’m being a blank slate for a while. That feels kind of good. I worked up half the tunes for the new record as part of a batch of demos I sent to Zorn last year. Then he sent me an email saying, “Let’s do a record of just the Brandwein tunes.” From October on I worked up the rest of the material, thinking as a solo guitarist. I had to comp with myself and do the bass line. When I got to New York and started to play the tunes in the studio with Greg and Cyro, suddenly half the arrangements I had made, meticulously developed and practiced, turned into soloing. I don’t know where that came from. It was something I never practiced, and I’m kind of happy about that. I played a lot of jazz for years and none of it was recorded. I think there’s some nice playing on Princess. Greg and Cyro were creating spontaneously. They had just learned the tunes. That’s how those guys work all the time. When Zorn does a project, the musicians come to the studio, then he shows up and gives them tunes they have never heard before. John Coltrane liked to do that, too. You get a very, very fresh sound. PLE: Has there ever been anything you wanted to play but couldn’t? TS: Sure. All kinds of stuff. If there wasn’t, there would be no reason to live. I’ve been playing “Giant Steps” a lot lately, trying to figure out how to play that tune. For years I’ve been trying to do a follow-up to Nutcracker Suite, an arrangement of Prokofiev’s Cinderella ballet, but I can never find enough time to allocate to it. I did about five of the tunes ten years ago. Prokofiev’s music is something I’d like to figure out how to do on guitar. Maybe that will be the next thing I do. PLE: A City Pages article from 2002 mentioned your trips to Japan and your interest in Japanese music. Tzadik has a “New Japan” series. Any chance we’ll see you there? TS: I’ve got an idea I have pitched to Zorn and felt might be cool. In Japan, there’s a type of music called Enka music. It’s Japanese, but with a Western musical influence that goes back to the 1800s, when the Meiji dynasty decided to embrace Western culture and technology. It’s soulful, sad music about broken hearts, betrayal, the usual stuff, like Hank Williams, but the Japanese version, with cool Japanese pentatonic scales mixed with Westernized arrangements. I’ve checked into and heard stuff that definitely caught my ear. Sometimes you hear things and a light goes on and you can start hearing and sensing how that would go on guitar, how cool it would be. PLE: So you’re still passionate about this? Visit Tim Sparks's website for sound clips and a video. Originally published on jazz.com, November 2009.